Episode XXXVII - Is someone getting the best, the best, the best, the best of you? I am halfway through with my Taxotere treatment. High Five! Even though over time I have only increased in chemo side effects, I was now only two Taxotere (6 treatments, 3 Neulasta shots) to go! Time to do a little cheer!!! 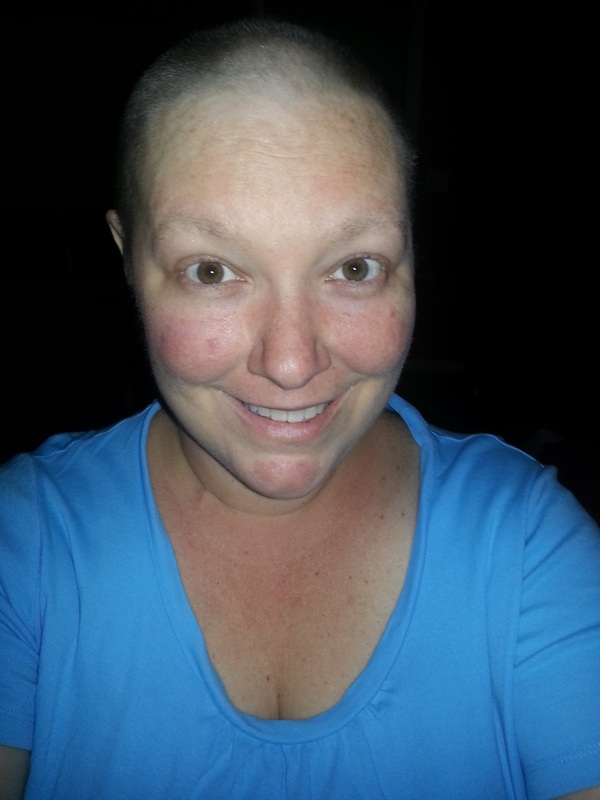 I went through my normal chemotherapy routine, but was relieved today that I had no port pain when I got stuck. It helped that I did cover the entire port area at 5:30 am and the nurse was right on target. So I felt nothing! Afterwards, it was time for my chemo which was pretty much the same as last time, but because the blood work was cleared quicker making my treatment start & end time earlier. A new chair-side visit with the nurse practitioner was scheduled due to my previous strep infection. They wanted to make sure that my lungs were clear and I was recovering without signs of potential danger. I got the all clear and a stern warning that I would have to have a flu & pneumonia shot from them soon. I will be double booty cheeks up at a future visit!! Of course, that means the kids would have to have a flu shot as well... something I have always avoided. Every time I have given them the shot - they have gotten the flu. The years they have not gotten the shot, they haven't gotten it. Here's hoping to a new pattern! The rest of the treatment flew by... my friend and I were shocked by how quickly we were able to leave. Since she has decided to take me to my chemotherapy treatments and to lunch regularly I have officially designated her my chemo-buddy. And how lucky am I to have some great company during these difficult times. It really allowed me to feel human and have some fun company, especially the lunches afterwards. It was nice to sit down and feel like me before those side effects kick in. But before I could head off to a nice lunch, I had to go get a necessary prescription that I almost forgot due to chemo brain. Surprise. Surprise. The insurance company had not completely fixed the insurance and still had our family as not actively having insurance. After many, many minutes on the phone with a representative it was eventually straightened out and my prescription was covered. I spent last week having the same discussion with a different representative at another doctor's office. 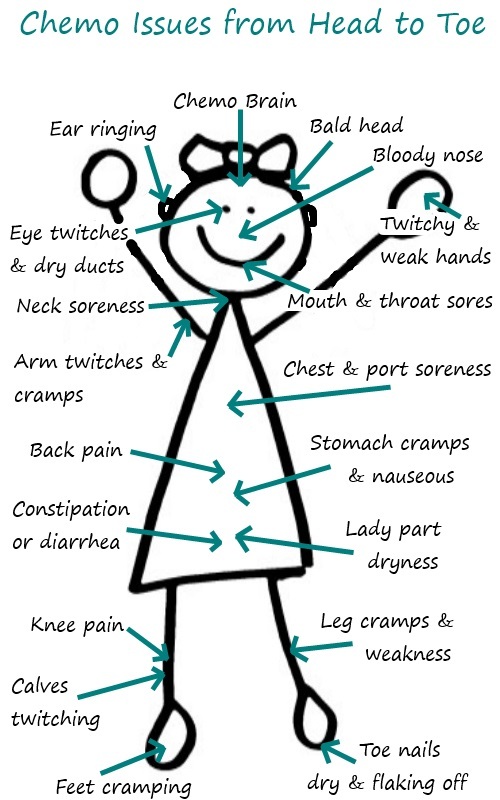 I was so frustrated with the situation... more frustrated that some of my chemo side effects were peeking their ugly head due to the timing and stress! Even though my normal chemo side effects had kicked in and I would have loved to just medicate and sleep when I got home - that possibility was not an option. It was a whirlwind of chaos when the kids arrived with school work (including lots of make up work from the week before), hungry wanting an early dinner, and just normal kid craziness. Most of the chaos was because our normal routine was altered. 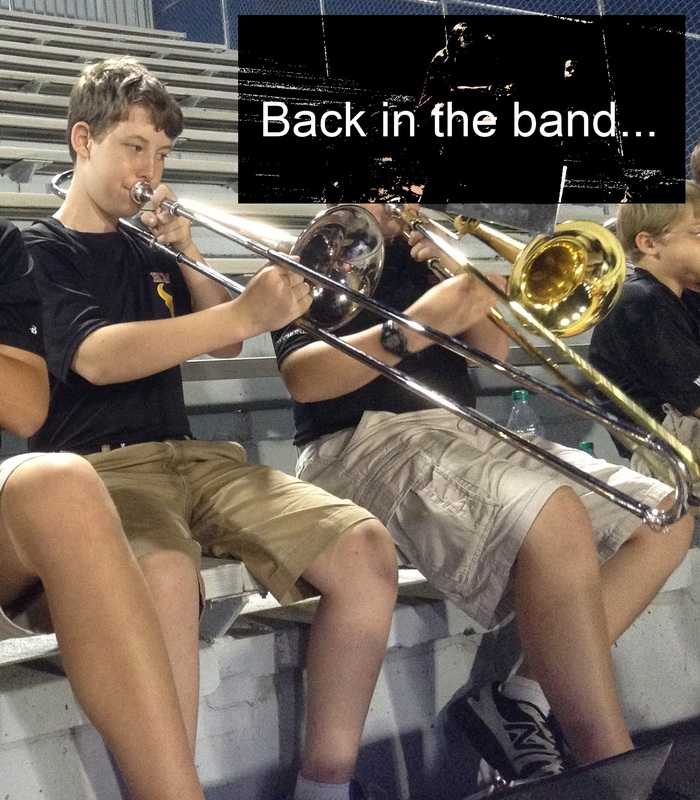 My son decided he wanted to re-join band... a good thing! However today was his first day in band, so it meant that we were way behind in school paperwork that I was told needed to be in asap due to camps & fees. It also meant he had to go to the football games to play and of course the first football game was tonight. Go figure! After missed calls and walking to a neighbor's house, I finally got in touch with one of his friend's mother and he had a ride home. I felt somewhat accomplished! I then thought I will have him ride to the game with my chemo-buddy (who's daughter was in band)... but it was now after 5: 30 pm and he was suppose to be there by 6 pm. It was too late to call... I felt slightly less accomplished! My mom was in town and going to take him, but had no idea how to get there. So my poor husband ended up leaving almost right after he arrived home from work, driving back out and to the game. What a afternoon?!?! I got a good picture from the night - Thanks! It was not until 5:30 pm, side effects and all, that I finally got to sit down. Hopefully, I can avoid days like today on future treatment days... as it made for a longer challenging night. Even though it was busy - Even though it was difficult - I just kept pushing through and tried to do the best I could. Giving my attention to the details that needed to be done has become a harder task as I get further into my chemo! Even though it was a crazy day with many surprises... it all worked out in the end.